Amy Hammond asked herself, “where do you want to go?” sparking her artistic side to express her love of surfing. 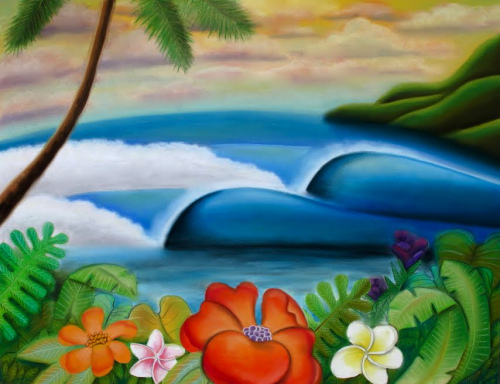 Although she is now landlocked in Michigan, her experiences surfing in Florida and Hawaii come to life in pastels, Prismacolor, and paper. We spoke with Amy to find out how she became a surfer, her approach to her artwork, and her passion for photography. You live in Michigan, how did you fall in love with surfing? Michigan has only been home for about three years. I fell in love with surfing in Florida where I grew up. At 13, my friend and I randomly decided to rent a couple of big foam long boards and give it a go. We were out for nearly 6 hours. I didn’t even stand up on the first day out and could only get up on my knees, but got hooked on the feeling of riding the wave into the beach. I was drawn to surfing because it brought excitement to my life, you know, daydreaming about waves while sitting in class, drawing surf sketches and Roxy logos on my notebooks, always checking the surf report, getting up at sunrise to go out, and just being a part of another world. It was like an escape from real life into a lesser known subculture. At the time, it was pretty male dominated, so it was exciting to be surfing when no other girls I knew were doing it. After my first semester of college, a surfer roommate and I dropped out and went to Hawaii the following winter. The love kept growing from there. It’s been good for me to be in Michigan and ground myself in other passions and influences, because it’s important to know who you are without surfing. That might sound silly, but when you’ve clung to it for so long, well that’s often the case. 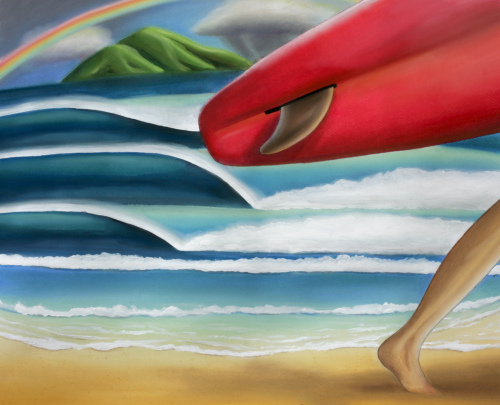 It’s clear that your art is an expression of your love of the sport and surfing. How do you approach a new piece? I usually start drawing or painting when I feel restless and anxious. I think we all feel that way sometimes, especially when we feel like we’re somehow missing out on all that life could offer. Truth is, there is something to be said about contentment and thankfulness for what you have right here and now. Waves or no waves. So art began as a coping strategy. I’ll sit down with a blank sheet of paper and ask myself, “where do you want to go?” and just create the reality on a flat surface. Sometimes I’ll just make something up out of my head without looking at any photographs or art. Other times I’ll combine like 3 or 4 of my photographs into one painting. I’ll like the sky in one, the color scheme in another, the lighting in another, and so on. Tell us a little about your creative process? My creative process goes something like this: daydream, acquire some mental images, look at photographs, sketch out a scene with a light creme pastel on a sheet of textured charcoal paper, then pick out colors. If I’m painting a wave, I’ll start by smearing medium hues into the paper. Then I’ll rub in some paler blues and teals for the lighter tones, followed by dark blue, dark purple, and/or black shadows, and finish with white and yellow highlights. To blend the pastels, I only use my fingers. No brushes or tools needed; it’s like a throw back of finger painting in elementary school. Also, I don’t “fix” the finished pastel pieces with any sort of spray because no matter how good the fixing agent is, it still diminishes the colors and finish somewhat. Instead, I frame them behind glass for preservation. Besides pastels, I enjoy layering colored pencils on Prisma markers to create colorful drawings. 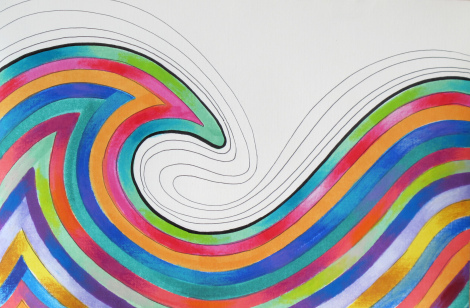 My favorite piece is this abstract ink drawing of waves colored in with chalk pencils. It’s one of the very first wave drawings I ever made, about 3 years ago. The composition kinda grabs my eye and the odd color scheme keeps it interesting. I don’t think I could ever sell it. I’ve had it hanging on my wall for quite some time, so it’s taken it’s own personality in my room. Do you know what I mean? You’re a photographer as well. What captures your eye when you have a camera in hand? Landscapes are my favorite subject to photograph, but just about everything captures my attention when I have a camera, that’s the problem! I’m usually in my own little visualizing world, walking around, bending, stooping, and doing whatever I have to do to get a good composition. Like, why won’t the top of that building align with the horizon? Ahh, maybe if I just climb up that tree to get some height…? Yes, this is my thought life when a camera is in hand. Lighting always makes a picture stand out and can give the plainest object a lot of beauty. So, I admire photographers who can manipulate light! Thanks so much for speaking with us, Amy. Now I feel like running to the art supply store and paint some waves! You can find out more about her upcoming shows and also purchase her artwork at her website here. Reblogged this on AMY HAMMOND.